PAGON, Indonesia (Thomson Reuters Foundation) – Falling yields forced rice farmer Shamsuddin Bin Rus to consider abandoning his land and moving to the city to find work as a labourer. But his 41-year-old wife, Kaswati, came to the rescue by participating in a loan programme that enabled her to start her own small business selling jackfruit snacks. Low rainfall in recent years has reduced the harvest from her husband’s 2.5-hectare (6-acre) paddy plot in Pagon village, in coastal Subang district some 130 km (80 miles) southeast of Jakarta. The 58-year-old rice farmer said he used to get more than five tonnes of rice per hectare, but now reaps less than four. “How can we depend solely on farm income any longer when the rainy season is delayed by 25 to 30 days every year and ends 10 to 15 days earlier, and (it does) not rain as much as it used to?” Kaswati said. “Every year, we do the same labour (and) sow the same amount of paddy seed on the land, but the crop productivity is no longer the same,” she said. 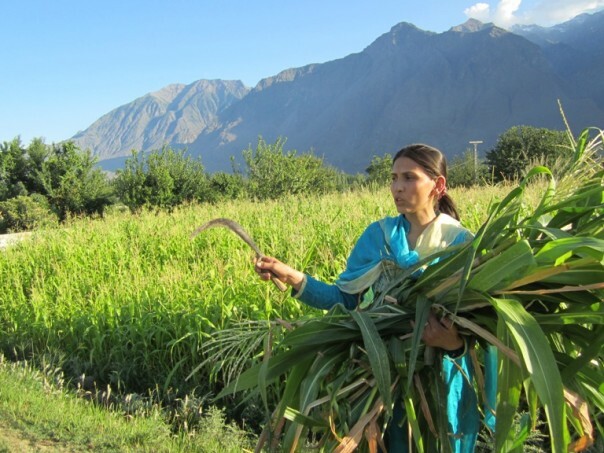 But the couple have not had to leave their home in search of work thanks to a scheme set up by the International Fund for Agricultural Development (IFAD). The project, which began in 1997 in several villages in Subang district, offers low-interest loans to people in farming communities to help diversify their incomes, so they can better survive economic losses from poor harvests amid changing weather patterns. Kaswati borrowed 4 million Indonesian rupiah ($400) from the scheme at an interest rate of 1 percent in 1999. She also joined an economic self-help group that was part of the programme. “Having received training about efficient use of the credit, I launched a small-scale jackfruit snacks stall in my village,” she said. Over the years, her business has boomed. 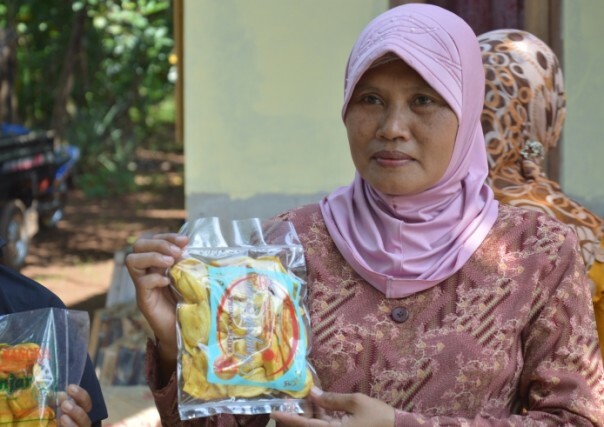 From monthly sales of 40,000 rupiah ($4) in 2000, she now earns 4 million rupiah ($400) per month, having expanded to markets in other villages in Subang and adjoining districts. Bin Rus said that, without his wife’s earnings, the family would have fallen into poverty and debt. Now he no longer needs to borrow cash for seed from moneylenders, who charged high interest or forced him to sell his crops to them at below-market rates. Ronald Hartman, IFAD’s programme manager in Indonesia, said the loan scheme has been scaled up to raise the living standards of the poorest rural families in 18 provinces. Experience has shown that low-income farmers and fishermen are creditworthy and demonstrate economic initiative when mobilised into self-help groups, he added. Group members have chosen from up to 200 types of business activities, ranging from livestock-raising to small-scale trade, food processing and handicrafts. Most are given training in financial planning and management, Hartman said. IFAD reports that over the years the scheme has loaned a total of 113 billion rupiah ($11.4 million at current exchange rates) with a repayment rate of 86 percent. The incomes of participating families have risen by 41 to 54 percent. Agriculture is still a major source of income in Indonesia, employing 57 percent of the labour force and accounting for two thirds of the country’s GDP. But changing climate and weather patterns have forced some to abandon farming, putting the livelihoods of whole communities at stake. According to the Indonesian Agency for Meteorology, Climatology and Geophysics, data gathered from 174 climate stations in major food-producing areas of the country indicate that rainfall is declining by nearly 250 mm per year. Indonesia receives on average 1,755 mm (69 inches) of precipitation annually. Indonesia is the world’s largest producer of rice after China and India. But in the past five years, the country of 248 million people has also become the world’s seventh largest rice importer, requiring an annual average of over 1.1 million tonnes of imported rice to meet its domestic needs. Zulkifli Zaini, a crop scientist with the International Rice Research Institute in Indonesia, said the Southeast Asian nation’s rice output has not declined, thanks to the cultivation of improved varieties. But the fact that it has remained static over the past five years is a cause for concern. Rice accounts for half of per-capita food consumption, so meeting rising national demand has become a daunting challenge for the government. Experts are pressing for climate adaptation programmes that will increase crop planting areas and boost crop intensity and productivity, alongside campaigns to lower the average consumption of rice. “Improved land management practices that contribute to soil moisture retention and maintain the amount of nutrients in the soil at appropriate levels can strengthen resilience as well as enhance productivity,” said Ir Haryono, director general of the Indonesian Agency for Agriculture Research and Development. He also stressed the importance of helping farming communities diversify their income sources to survive shocks from erratic weather patterns. Replication of IFAD’s loan programme in other provinces could help with this, Haryono added. Kaswati, meanwhile, is making the most of her entrepreneurial success. “Before I rolled out the business…I had no say in our family affairs and was completely dependent on my husband economically,” she said. Now her husband listens to her and values her decisions about family matters. Saleem Shaikh is a climate change and development reporter based in Islamabad.